Leaving home at 6am yesterday on a Bank Holiday Monday, I flew to Prague for the 30th International Confederation of Midwives Congress http://www.midwives2014.org/ - a momentous occasion when over 3000 midwives from across the world will gather together. I am here early as our twinned midwives from Cambodia and Uganda will attending the pre-congress ICM council so I will be supporting and spending time with them as well as preparing for my presentations, workshops and our exhibition stand. Our Nepalese twins will arrive in a few days' time. I nearly missed my connecting flight in Vienna - we had almost touched down when we took off again at alarming speed. The captain later told us there had been a car on the runway! The time it took to ascend, circle and land again gave me just 20 minutes between flights and I had to run from one end of the airport to the other. Amazingly my suitcase and me both made it! As I arrived in daylight and had no immediate deadlines I braved the public transport system with my suitcase - one bus and two metro trains later I arrived at our hotel, right by the conference centre. I had intercepted an e mail from the Cambodians who were holed up, too scared to venture out, so I went straight over to meet them at their hotel and we took advantage of our free afternoon for some sightseeing. Together we negotiated the metro once more and found the centre of town, wandering around beautiful buildings and stopping for drinks in streetside cafes. Lida and Thida hit the streets of Prague! They were very jetlagged after flying Phnom Penh - Bangkok - London - Prague and flagged after a couple of hours but we squeezed in a visit to the most amazing Cheese shop to introduce them to this European delight, not a feature of the Cambodian Diet. They were amazed by the whole parma hams hanging in the store - I love seeing the world through others' eyes. Finally we met up for dinner with Professor Lesley Page, the RCM's President, and managed to negotiate some rice for Lida even though it was not on the menu - Cambodians need to eat rice every day! Lesley was moved to hear about their experiences of losing family in Khmer Rouge times and the long-lasting impact this has had on Cambodian society and midwifery. Slowly the world of midwifery is gathering here in Bohemia. I was overjoyed to see Pashtoon Azfar, founder of the Afghan Midwives Assocation and now working with the International Confederation of Midwives. We have worked together twice in Nepal and she's an amazing midwife with a powerful message. Unfortunately our Ugandan twins are not yet here - UK visa delays mean they could not catch their flight as planned. All of our project team and contacts are working hard in UK, Uganda and Prague to make a miracle happen. Meanwhile, prayers and positive vibes appreciated! At the end of a long day this was the best sight in the world. More blurb from Bohemia soon! He fancied my friend, she fancied someone else so palmed him off on me. Met by letter from Africa to Cambodia, blind date, love at first date though not at first sight. Long distance relationship for over a year, got married when we hardly knew each other, adopted a baby 3 years later, 18th anniversary approaching. Still best friends. At our wedding with Emma, the friend who introduced us! In late 1994 I was approaching the half-way point of a two year stint as a volunteer in Cambodia, running the health component of a community development programme in rural Prey Veng province. Far away in Africa there was a huge refugee crisis after the Rwandan war and Emma, another midwife who had been my lodger in Nottingham (and about whom I wrote in my previous blog) volunteered to go to Goma in Zaire (now The Democratic Republic of Congo), on a CORD/Tearfund relief team. Emma had already lived in Africa for a year so was a perfect candidate. Emma and I wrote letters to each other - in neither situation did we have access to TV so writing letters to friends and family was the default evening entertainment. Invariably Emma's letters were full of team gossip - many of her team in Zaire were CORD veterans with whom I had worked on previous assignments in Thailand and Iraq - and I lapped it up, being far away from anything resembling a social life. So when she wrote in great detail about an amazing guy on her team I naturally assumed she saw him as potential boyfriend material! Only at the end of the letter did I realise she was trying to match-make on MY behalf. There was another folded piece of paper in the envelope, typed rather than hand-written. Intrigued, I read the enclosed letter from Emma's team logistician, describing how he had recently built a refugee camp for the first time and cracking several corny jokes (why oh why didn't I heed the warnings then....?!) He more or less acknowledged that Emma was trying to set us up and that he was only writing the letter to get her off his back. That was my challenge! I wrote back, equally tongue-in-cheek, asking all sorts of personal questions, and we were soon exchanging regular letters. Some time later I went back to the UK for a month's leave. I travelled with Jenny, an Australian volunteer in Cambodia who need some R&R and who I had invited to join me in the UK. Jenny and I travelled to Nottingham to stay at my house and to reconnect with Emma who had by then returned back to her job as a UK midwife. The phone rang one evening.... and it was Stephen, the logistician from Zaire, who wanted to talk to me. I didn't get it. I was sure he just wanted to speak to Emma but no, he kept calling back! After several phone calls lasting many hours we decided to meet up in London on a semi-blind date. Stephen and I had said about as much as there was to say without meeting in person and the phonecalls were getting frustrating. My parents lived in London so a few days later I travelled south to stay with them and attend my Granny's 90th birthday party. Mum was a bit dubious about me meeting someone I didn't know so tasked me with some shopping as a focus for the day, in case it all went pear-shaped: I was to come home with purple candles and cream napkins for Granny's birthday party table. Stephen and I had seen photos of each other (neither of us much liked the look of each other!) but had never met in person. 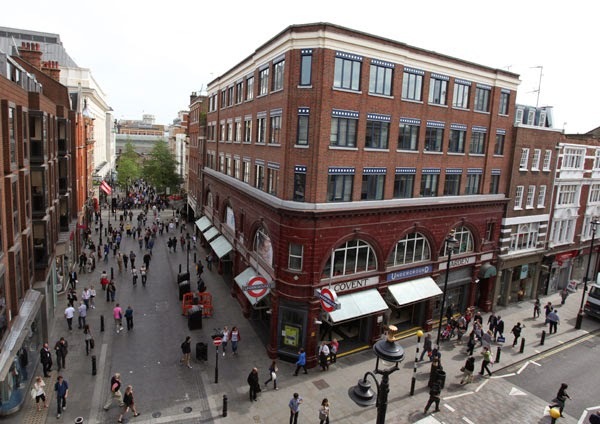 So on Thursday 19th January 1995 we met at Covent Garden Tube Station, at the corner by a lampost! Only a random pic downloaded from Google so don't try to find us! He came round the corner and I still wasn't sure I liked the look of him. Had had deep set eyes and a goatee beard. He didn't look like the sort of guy that could be trusted - too many hidden depths! He had similarly unflattering thoughts about me - I was wearing a borrowed puffa jacket (it was January and my clothes were in storage) and was facing into the wind so the jacket was even more puffed out. He thought I looked like a bouncer! It all started to seem like a very bad idea and I quickly announced that I couldn't be long as I had shopping to do. However, to avoid a wasted journey, we went to a nearby cafe and carried on a conversation we had started on the phone a few days previously. One cup of coffee led to another and then to lunch, followed by a piano recital at St. James' Church Piccadilly (on the sly Stephen had consulted the 'whats on?' in Time Out but led me to believe this was entirely spontaneous!) He took me to the Candle Shop in Covent Garden for purple candles and to John Lewis for cream napkins - I should have realised that logisticians are experts at sourcing things. Walking back up Oxford Street towards the tube station, I took Stephen's arm and asked him 'What shall we tell Emma about our blind date?' to which he replied 'I'll tell her I like you very much'. 'I like you very much too' was my lame retort! We stood by the railings (now removed) at Oxford Circus Station for what seemed like hours, trying to reconcile our feelings for each other with the prospect of a year apart. I was not looking for a relationship and certainly didn't want to enter into a long-distance one. Neither of us wanted something superficial so we talked about the big issues there and then: marriage, children, divorce, faith. Quite something for a first date! We returned to our homes desperate to see each other again yet reluctant to put ourselves through unnecessary heartache. The following week we hired a small removals van and drove to the North of Scotland with all of my Granny's possessions in the back. And Jenny in the front. Poor Jenny! She had come for a holiday and got landed with the role of gooseberry in a growingly intense relationship. Jenny baled out at Edinburgh, she'd had enough of our steamy glances in the mirror. The journey was snowy and we barely made it. Steve was subjected to the whole Scottish family en masse as we celebrated Granny's birthday all over again. Despite our better judgments we couldn't help ourselves: we were in love! Returning to Cambodia three weeks later was so hard, as was the following year. Before Skype or E mail were available we had to make do with passionate letters, though they often took weeks to arrive. We made infrequent and very expensive long-distance phonecalls. Steve worked as a practice nurse in London and earned enough to come and visit me after 6 months. We went on holiday to Thailand together and he proposed on Krabi beach. I said I'd think about it, which he convinced himself was a 'no'. It wasn't a no, but I was aware we had spent so little time together and wanted to make such a big decision at home in the UK where I could seek the counsel of friends and family. After this things between us cooled and Stephen returned to Africa, this time to Tanzania, working again with CORD in Rwandan refugee camps. Though employed there as a logistician he was a brilliant A&E nurse with a law degree- a useful person to have around in a crisis. He threw himself into his work and his role in the team and told everyone he was over me! Meanwhile, back in Cambodia, I was distraught. It wasn't how I wanted things to be and I agonised over my foolishness and lack of trust in my feelings and in Stephen. I felt so far away and alone. The turning point came when Emma announced she was getting married and could I come back for her wedding? I got special permission from CORD to take a week's leave and flew back to the UK. Over a long conversation with Mum, the story came pouring out. 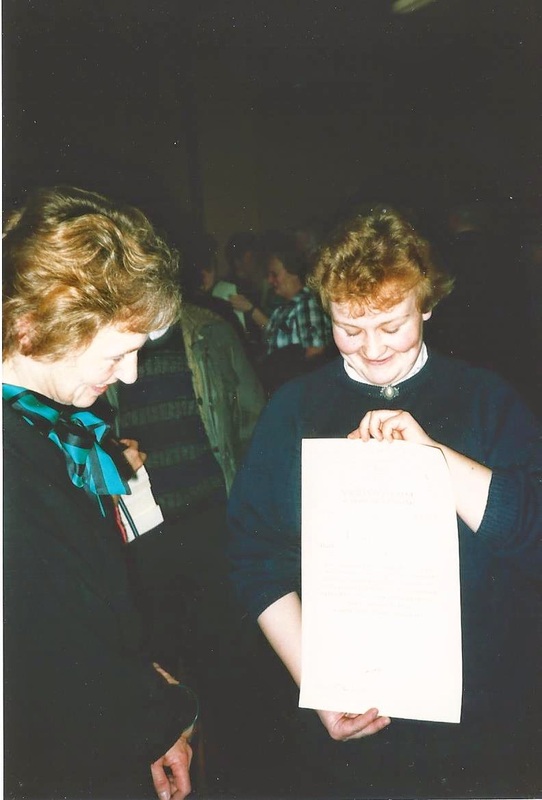 She couldn't believe I hadn't said yes and I realised that what I had yearned for was my parent's approval, not realising they had already given it! I suddenly felt free to make the decision Stephen had wanted and placed an immediate long-distance call to Tanzania. This time it was my turn to ask the question - and his turn to hesitate. He said he'd think about it! Thankfully by the end of the call he'd done all the thinking he needed to and we found ourselves engaged by telephone. 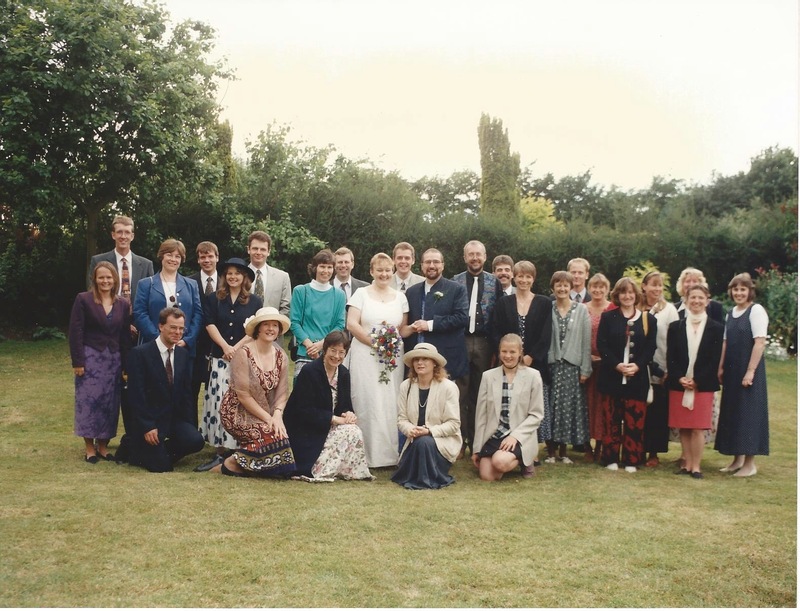 However, there was still another agonising 6 months apart before we could be together in the UK and we we married only 10 weeks after our return, planning a wedding across 3 continents and leaving most of the arrangements to our parents. I bought my own engagement ring in Cambodia (and our wedding rings) as I needed something tangible to represent our relationship and jewelry is much cheaper there than the UK! I ordered wedding invitations from a handicrafts project and bought Cambodian silk for my wedding dress and the bridal party outfits. 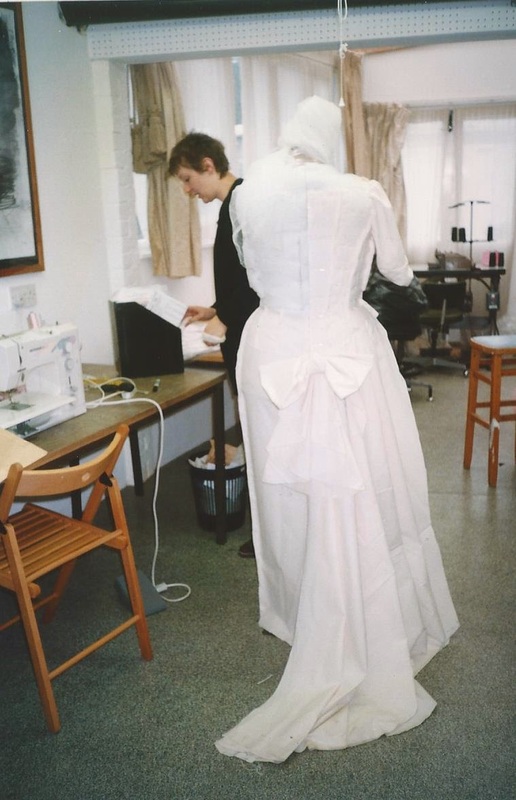 My sister was a theatre costumier and we designed the dress by post as I sent back cuttings from wedding magazines that everyone was mailing to me! My sister Esther, with the toile (Calico mock-up) of my wedding dress in her workshop. 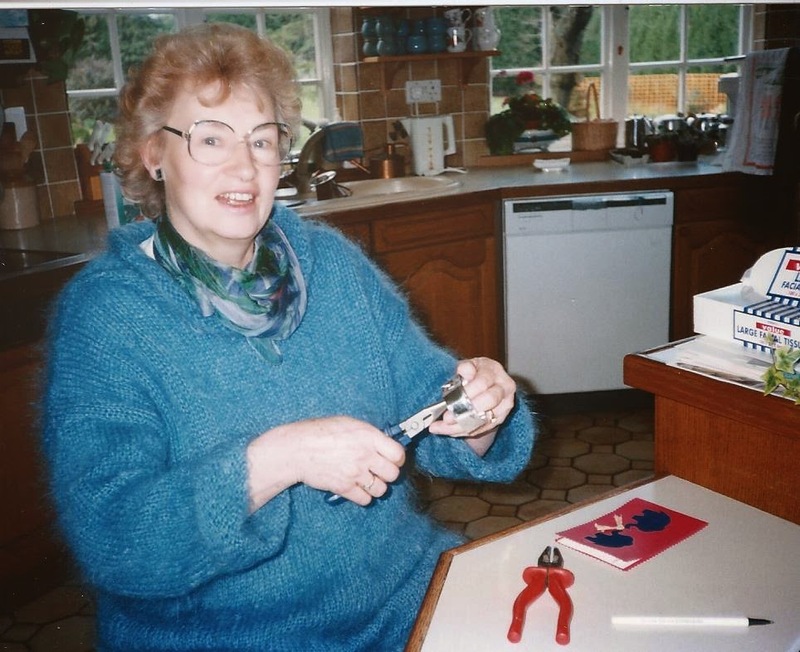 At the time she was making theatre costumes for the English National Opera and Ballet companies and several west-end shows so she fitted in making all our wedding outfits between costumes for The Lion King, Starlight Express and Pirates of Penzance! Mum hand-finishing our wedding invitations - two elephants tying the knot! 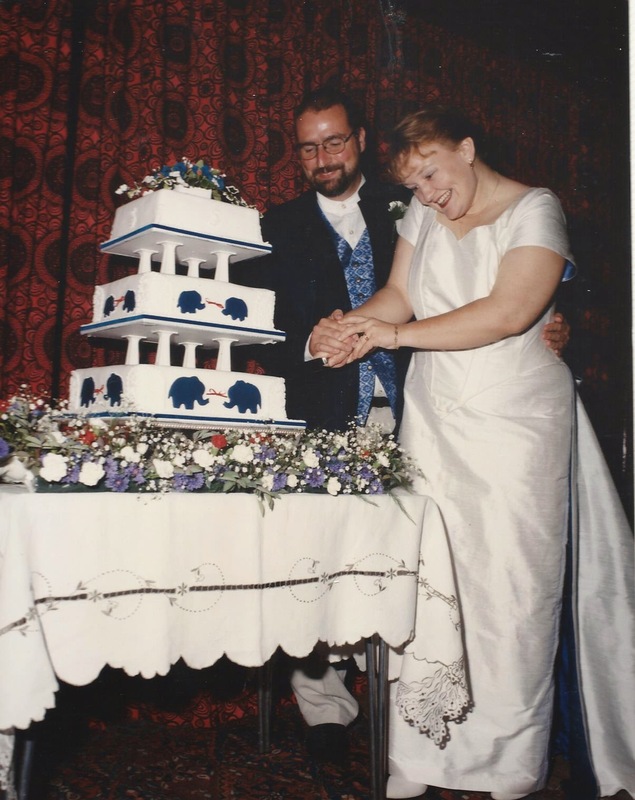 Cutting the cake - more elephants! The craziest Hen party - Boulonge for the night for £1 each! There was a mad singing waiter with a rose between his teeth and my Mum ate mussels for the first time. We got home at 3am! 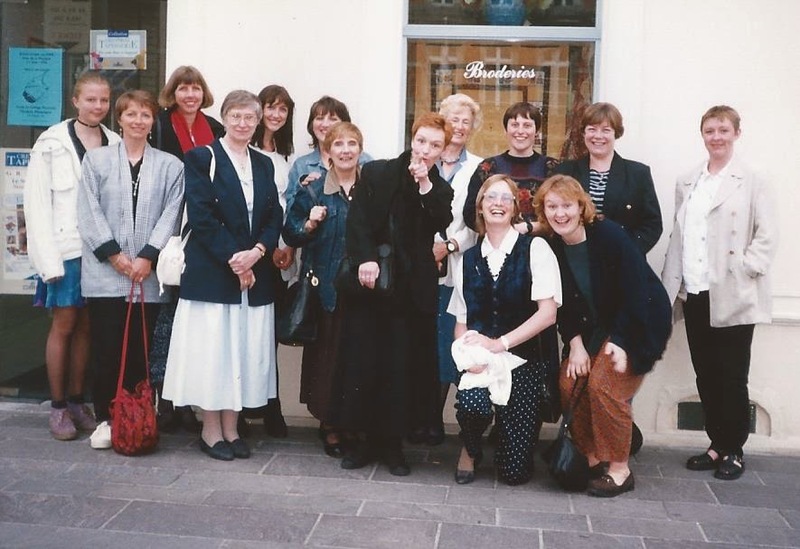 Back in the UK I had two hen parties: nineteen of us went to Boulogne for dinner then I took Emma and the bridesmaids for afternoon tea at Brown's hotel in Piccadilly. Stephen held a murder mystery party for the Stag-do with half of the guests in drag. Finally the day dawned. Over three hundred guests at Christ Church Sevenoaks, tea and cake in the church hall then nearly two hundred guests to a marquee in my parent's Oast House garden. 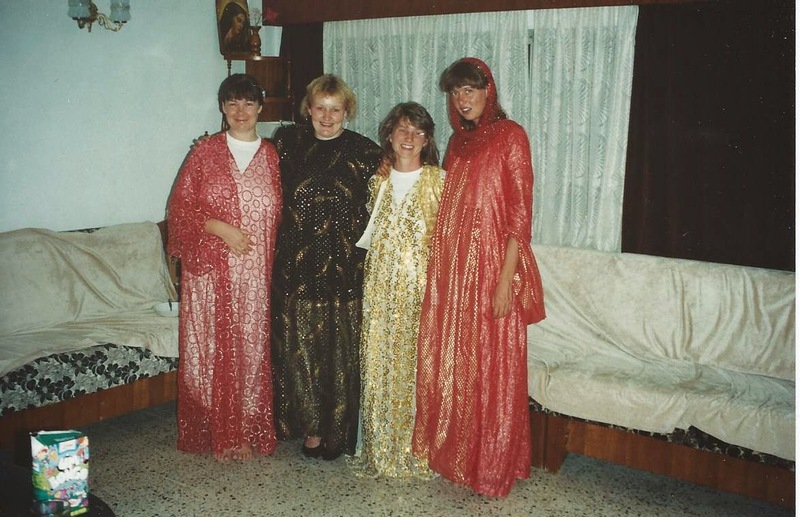 People travelled from all over the world - my bridesmaids from Afghanistan and India, Stephen's best friend from Norway. Many guests made a weekend of it so we came back on Sunday for round two! My father made a classic faux-pas in the wedding speech, congratulating Steve for having so much experience under his belt! Two days later we left for a two week honeymoon in a borrowed cottage near Inverness and that part of the world has always held a special place in our hearts. 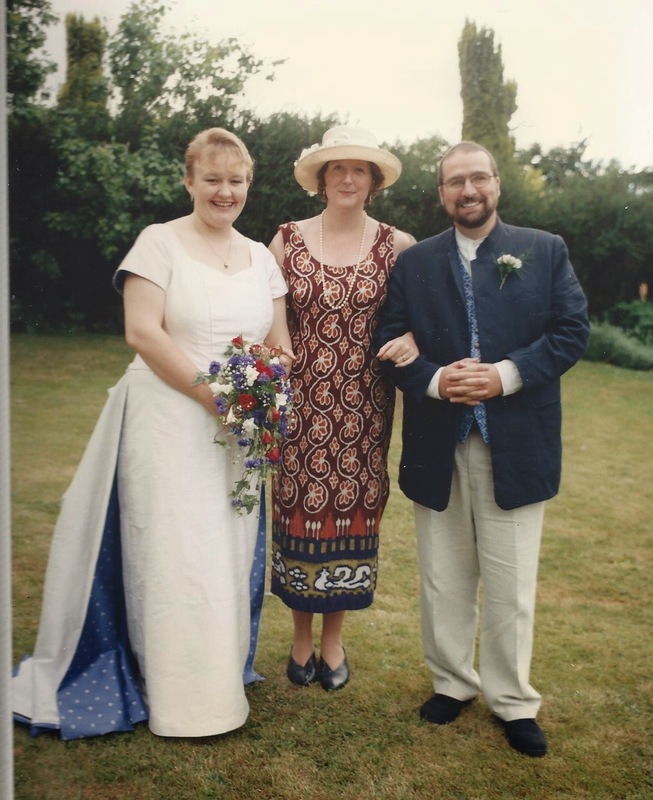 Next month we celebrate our 18th wedding anniversary. 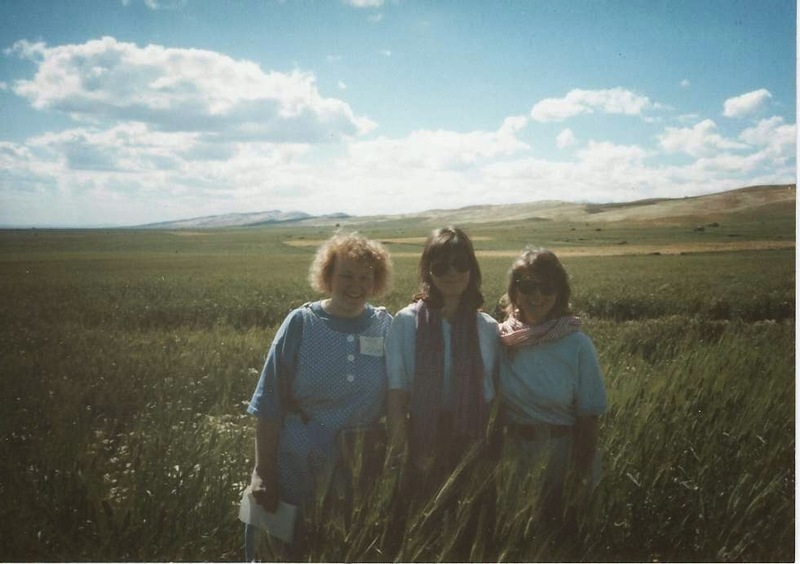 In those years we have lived in Reading, Albania and Kent, survived various surgeries and setbacks, adopted a beautiful baby girl from China, worked in a variety of roles in and out of the NHS, Higher Education and the Private Sector and are still best friends. It certainly hasn't all been plain sailing but we remain convinced it was worth the risk! Maybe our story shows that looks aren't everything, some things are better when you have to wait, you don't need to live together before you get married despite popular culture, and that some people are just made for each other. It's exciting to think what new challenges the future may hold! I am aware that I have readers of many faiths and none and try to make the blog accessible to all. However, there is an important spiritual addendum to the story of my year in Iraq that completes the picture. Feel free to ignore this bit if it doesn't float your boat! My faith is a quiet one. I certainly don't experience God speaking to me every day. There have, however, been some notable exceptions where some words in the Bible have seemed to be directed straight at me in my particular circumstances. '13 Now listen to me, you that say, "Today or tomorrow we will travel to a certain city, where we will stay a year and go into business and make a lot of money." 14 You don't even know what your life tomorrow will be! You are like a puff of smoke, which appears for a moment and then disappears. 15 What you should say is this: "If the Lord is willing, we will live and do this or that." It was as if God was saying 'You had a plan to be here for one year, but how much do you know about life? You need to leave the decision making up to me!' As the year progressed I became more sure that I should stay and volunteered for a second term. At the end of my stay in Thailand my whole career plan had changed: I knew that I would be returning overseas and needed to study midwifery, not children's nursing, to be able to respond to the enormous needs in maternal and newborn health. The midwives I had met in Thailand had so impressed me with their authoritative knowledge and I wanted to be like them. 'All I want is to know Christ and to experience the power of his resurrection, to share in his sufferings and become like him in his death'. I felt God saying to me that if I really wanted to know Jesus and to experience his power to help me in my daily life, then I needed to be prepared to also suffer as he had done. I felt confused and a bit miffed. Hadn't I already suffered, giving up my career plan and spending two years living in a remote Thai village, working in a refugee camp? I asked God to show me what he meant, to make it crystal clear, and then to give me the strength to respond. That evening I watched desperate TV footage of Kurdish refugees on the cold mountains and God said 'that's where I need you right now'. I was still dubious. Could God really be asking me to do this? I talked to the leaders of my church and they encouraged me to respond. One woman wrote me a moving letter saying she had been praying about how she could respond to the crisis but had no skills and had family ties - and then I had turned up wondering whether I should volunteer. She wanted to support me financially and wanted me to be her hands in Iraq. I felt humbled. And so I went, and you can read about this in the Blog. And I did feel in many ways that I had learned what it was to suffer. I suppose I could question why a loving God would want his child to suffer and to experience PTSD. Isn't that cruel? I don't claim to understand the divine purpose. However, I can see with hindsight how my experiences have shaped me into a better human being, aware that I am vulnerable and not invincible, aware of my physical limitations and aware that anyone can experience mental health challenges, however strong they may seem. I have realised that I don't always know what is best for me and I need to be prepared to question myself and seek guidance from others. Right now I am doing a job that I could never have dreamed of. All of my experiences to date have given me the skills I need to support volunteers, to combine my knowledge and love of midwifery with my overseas experience, to support midwives in three countries where maternal and neonatal mortality is still far too high and to use the language skills I learned in my twenties, my skills as a clinical midwife, a midwife teacher and researcher. Reflecting on the experiences that brought me here, I am grateful to God for His leading and for all of the challenges he has laid in my path. I have recently been reflecting on my experiences of trauma and how these have shaped my life. I am hugely grateful for the relative stability of my current life whilst recognising the inevitable long-term impact that trauma can have. In April 1991, aged 24, I had returned home from two years working with mothers and children in a Cambodian refugee camp in Thailand and had just completed a course at the Liverpool School of Tropical Medicine. I had secured a place to study midwifery and was looking forward to a few months off to recharge my batteries and reconnect with friends and family. I went away to 'Spring Harvest' (a Christian conference held at Butlins) and, whilst watching TV in our freezing cold Butlins' chalet I was confronted with heart-breaking images of Kurdish refugees literally freezing to death on the mountains in Iraq, casualties from the recent Gulf War but also from years of ethnic cleansing by Saddam Hussein's regime. At that time I felt emotionally and physically exhausted with very few reserves but couldn't escape the realisation that I had qualifications in nursing and tropical medicine and two years' experience of working with refugees. I knew that I had the ability to respond where so many did not. Without wishing to sound pious, I also felt a strong spiritual 'nudge' and having shared this at my church I felt compelled to contact the charity I had been working for in Thailand, to ask whether they were planning a response. Six days later I left London Heathrow bound for Iraq, as part of a three-way collaboration between three different agencies. Two members of the team (Seonaid and Mel) had also been working in Thailand so it was a reunion of sorts! We travelled through Turkey, picking up our Dutch counterparts in Ankara then flying onto Diyabikir before finally arriving in Zakho, an Iraqi town on the Turkish border, in a US army Black Hawk helicopter. Seonaid was almost obliterated by an enormous Chinook helicopter coming in seconds after we had hit the tarmac. She was saved by a US marine jumping on top of her and pinning her to the ground! Just arrived in the Black Hawk helicopter, moments before the Chinook descended! 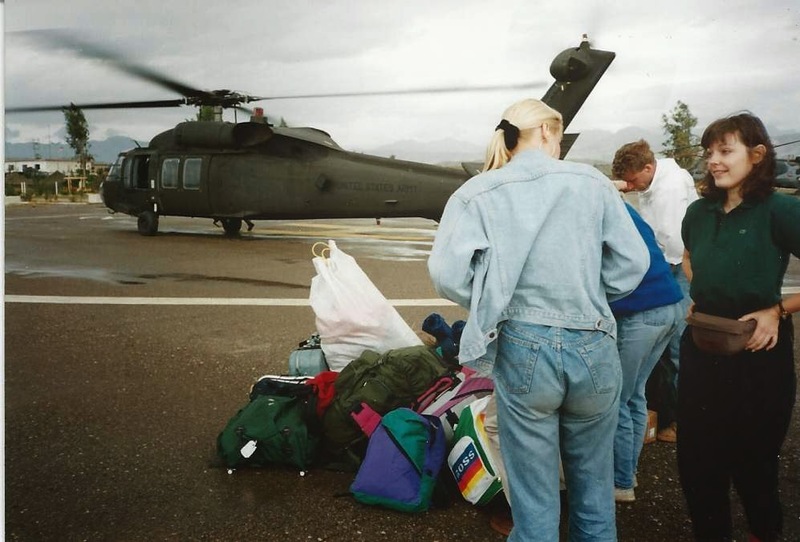 As civilians in a huge military operation we stood out amidst the khaki and beige like a sore thumb in our Millet's best pink, purple and green ski jackets and tents. It was my first experience of a war zone. Helicopters flew overhead constantly. We travelled everywhere in convoy with security radios attached to our belts and our cars - no mobile phones back in the day. The area had been heavily mined so we never left the path. We were met by Phil Chester, another Thailand veteran, and taken directly to a field where Mel, Seonaid and I were to set up a mother and child health feeding station. 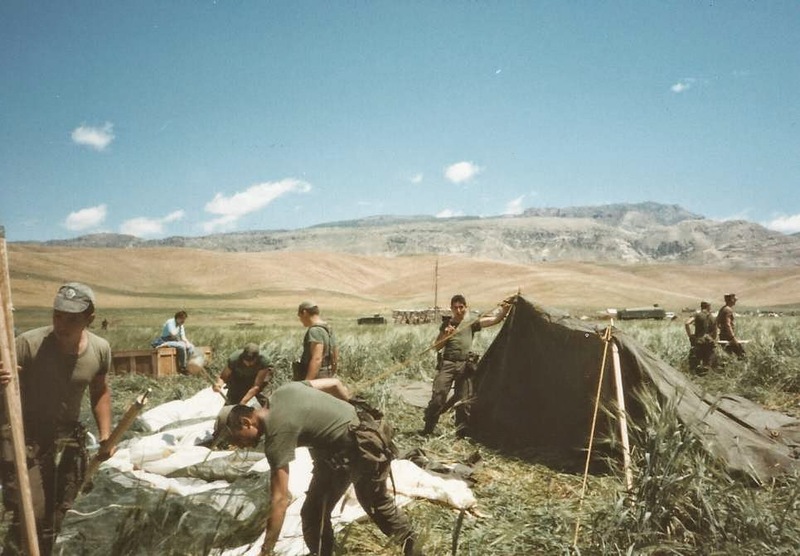 Military tents and camouflage netting were air-dropped by helicopter and a platoon of Italian soldiers arrived to help erect the clinic. The refugees were yet to arrive so it was all rather surreal. We camped with the US military reserves, sharing their meals and washing facilities. We got up early to use the shower but there were still long queues. When I realised there were two showers in my cubicle I called out, inviting someone else to use the other shower if they didn't mind sharing I was answered by a deep male southern US voice saying 'OK lady, ah'm a-comin' in!' Eventually the army built a separate shower block for the civilians. The individual cubicles in the mixed-gender block had suspended canvas shower buckets that had to be filled from above then were turned on and off with a shower head like the top of a tin of talcum powder. You first had to climb stairs behind the cubicles and walk along a platform, peering over the top to find your shower bucket and fill it up. We got used to showering with a constant stream of men and women walking past at shoulder height! The loos were shared and we avoided drinking too much in the daytime so we could use the toilet at night in the dark, shining our torches at people's feet to identify the occupied long-drops. Our clinic was soon over-run and we worked hard to rehydrate babies dying from dehydration and feed up the malnourished with a mix of dried skimmed milk powder, sugar and oil. Sometimes our intervention had come too late and a few babies died whilst waiting in the queue. Some team members left and others joined from the charity MEDAIR, including Bill, an Australian doctor, and some Aussie Nurses . Yvonne (Vonny) was one of these nurses and she stayed for several months. Together we set up a field hospital, taking over from the Dutch Army. There I learned about inappropriate aid as I spent hours sorting through out of date and unusable drugs sent by well-meaning donors. One day a huge lorry turned up in the camp with a renal dialysis machine for our hospital from an anonymous donor - we didn't even have electricity! We had to send it away. 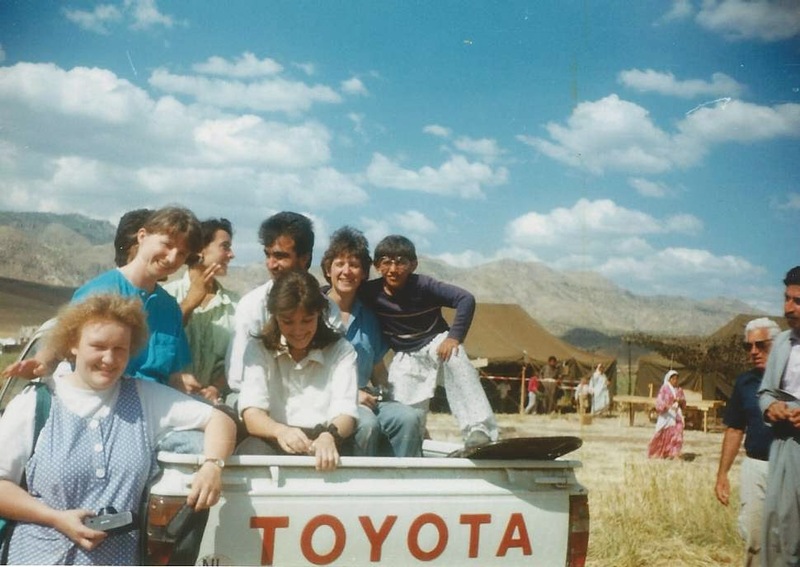 After three months many refugees moved on and so did we, to Penjwin in the east of the country on the Iranian border. We had heard of a worse refugee crisis here and there were far fewer resources and agencies on the ground. We camped this time with UNHCR, in a minefield that had been cleared prior to our arrival. There was a roped-off 'safe' area but we banged in our tent-pegs with some trepidation. We lost many balls and frisbees across the rope, never to be reclaimed. 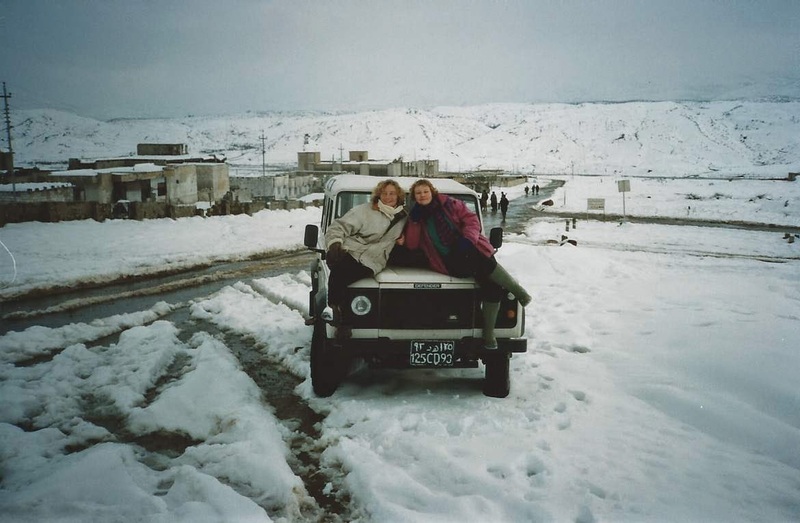 Penjwin, high up in the mountains above Suleimaniya, was far more isolated than Zakho and we were often cut off for days at a time with fighting in the valley. Water and food were scarce. Unable to reach any markets, my team-mates made me a 25th birthday cake with Weetabix, cocoa powder and British Army ration-pack custard, topped with grapes and night lights! The various military ration packs we had been donated were a life-saver though I could never stomach the American 'tuna a la King' MRE pouch that was just like cat food with tabasco. We ate a lot of tinned sardines and cracked wheat with cucumbers and tomato, the only things available locally. We had a local cook but later found out he was a Hepatitis carrier. Mel was medivac'd out sick and many of the team spent weeks with diarrhoea, continuing to work unless we physically couldn't. The heat was scorching and we scoured the area for branches and leaves to build shaded areas in the camp. We had some wonderful staff including Cheeman, a young woman who became a firm friend as well as our translator and spent lunchtimes teaching us how to thread our hairy legs! When the crisis settled and her family returned to the city, we spent some weekends at their house, sleeping on the roof top in middle-eastern style. Cheeman, our Kurdish friend and translator, threading Seonaid's legs. Cheeman is wearing my trousers. She had no washing facilities in her camp so she showered at our camp and wore my clothes whilst her own were drying! 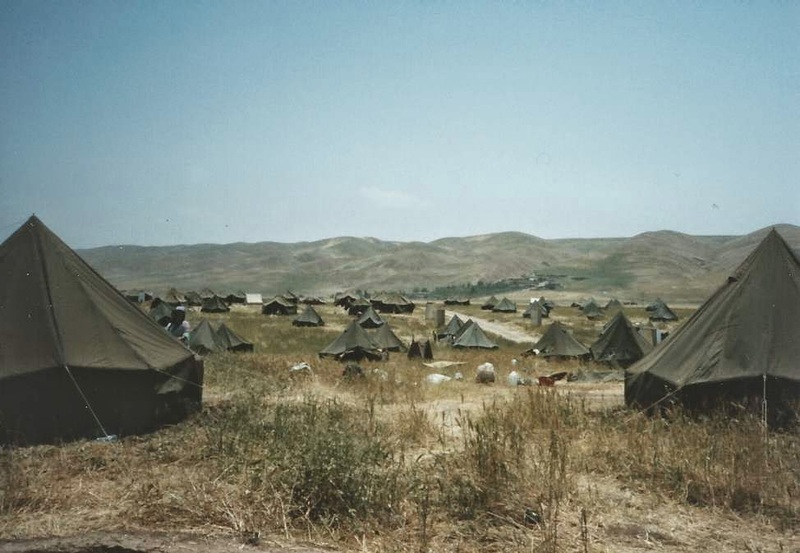 Penjwin had been blown up by Saddam Hussein in the 1980s but the shells of buildings remained and the UN provided building materials for reconstruction. 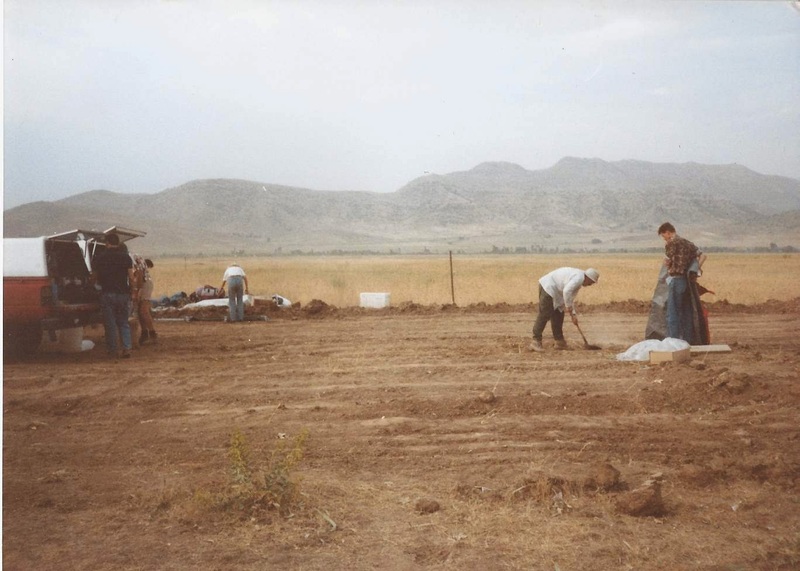 We helped to re-build the local hospital and worked alongside Kurdish doctors and nurses to run clinics for the local population, recently returned to their home villages after years in Kurdish 'Collectives' (one of Saddam's tools for ethnic and urban control). Unfortunately there were many hidden unexploded mines in the ruins and the casualties were often children who liked (as always) to play in building sites. I will never forget a truck turning up at the clinic as we were just closing for lunch with the dismembered bodies of two small children in the back, women wailing and pleading with us to help. Seonaid and I felt for pulses but were powerless to reconnect heads, torsos and limbs with their wellie boots still attached. We consoled the parents as best we could then drove back to camp and ate our lunch, not talking about that incident with each other until years later, back in the UK. There were always guns everywhere; every man and many children had an AK47 and they were fired in anger and joy - and at the clouds to bring the rain. Mercifully none of us was ever shot at but we were caught in the middle of a riot one morning whilst driving to work, hundreds of people with guns pressing our car from every side, urging us to put political pressure on America to remove Saddam from power. I remember, in the midst of my fear in the crowd, laughing at a banner saying 'George Bosh No. 1'. I am still unable to handle crowds and prefer to travel by bus in London rather than the tube in the rush hour, despite the longer journey. One on trip across Turkey for R&R, Geeske (a Dutch Team mate) and I took a taxi to the airport before dawn. It was a 4 hour drive through the mountains and our taxi drivers (a man an his brother) thought we might like some 'alternative entetrainment'. They stopped the taxi and one of them got in the back with me, touching me up, whilst forcing Geeske to drive the car. Thankfully we hit out at them and they got the message, leaving us alone. I think they genuinely thought that all Western women were as overly sexualised as those on the TV and were deeply apologetic when they realised we not interest. A sobering lesson that could have ended so differently. As summer turned to autumn we found a new campsite up a hill by a stream and the two engineers on our team, Richard and Wes, showed their true colours by capping the stream and building hot and cold water systems with running showers. A litre water bottle with holes punched in the base made an excellent shower head and Wes found a second hand mixer tap by the side of the road. They buried the water pipes deep in the ground so the shower even worked throughout the snowy winter. Genius. Romance blossomed between Vonny and Nate. The rest of us flirted like crazy with the UN staff who wooed us with alcohol brought in by diplomatic privilege! Kathy Carter and I both had guitars and we spent our evenings composing songs and poems and writing letters home to send with the next person travelling out of the country. We told and re-told jokes, getting more silly as the evening progressed. Our favourites were the 'what do you call a...' jokes, the best one being: Q'What do you call a man with rabbits up his bottom?' A 'Warren'. Imagine our response when MEDAIR introduced us to their new country director.... Warren. I couldn't look at the poor man for weeks without laughing and he never knew why! As winter arrived some of the team stayed camping in the mountains but others moved to the city of Suleimaniya, 2 hours drive down the mountain through some breathtaking scenery, to reach out to other areas. By this stage our team had mainly moved away from health programmes to school and clinic building, though we continued to do vaccine campaigns in far villages. The local contractors were paid in Iraqi Dinars which had hugely devalued since the war. Julia, our administrator, paid the bills with used notes in black bin bags! The security situation in town was tight and we had to check under the cars each day for bombs. Wes, from Northern Ireland, was used to it and trained our guards. Saddam reputedly had spies everywhere. We never went anywhere, not even to the loo, without our radios. Rachel Lavy, a midwife, joined the team and I was so impressed with her knowledge. 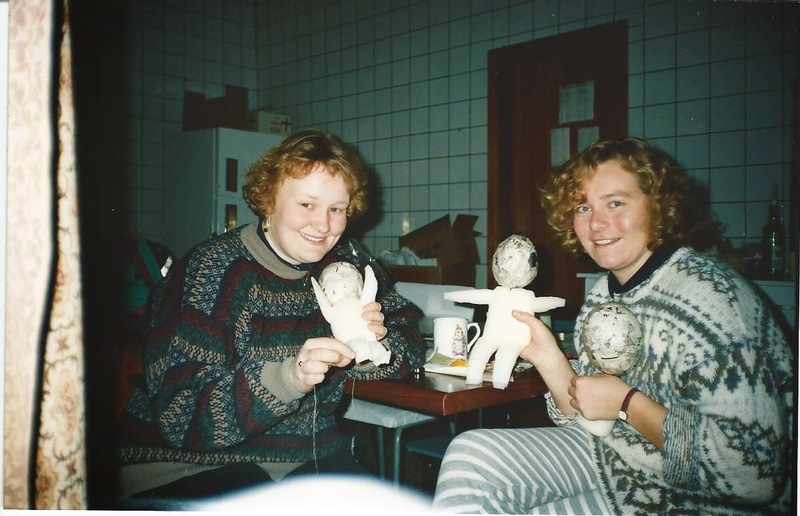 She and I ran a training programme for health workers undertaking antenatal care and we improvised teaching materials, making dolls and pelves out of balloons, papier mache and coathangers. 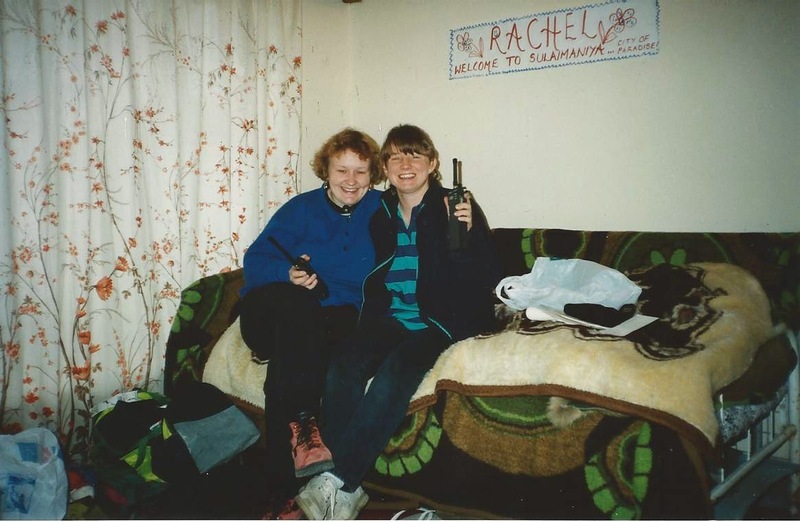 Rachel shared my bedroom and we discovered she loved ironing so everyone had beautifully creased clothes! We had sacked our cook, as so many people had been sick, so I took over the role of chef, trying to make marvellous meals out of the meagre supplies available locally, topped up with occasional supplies from a Turkey-run and the various military rations left over from the war. It was interesting to see how the different armies fed their soldiers: the British rations were full of tinned processed cheese, tinned beef and carrots, mashed potato and tinned strawberry jam. The Americans had great 'sundries' such as compressed toilet paper, hot chocolate and powdered grape cordial, as well as tiny bottles of Tabasco. 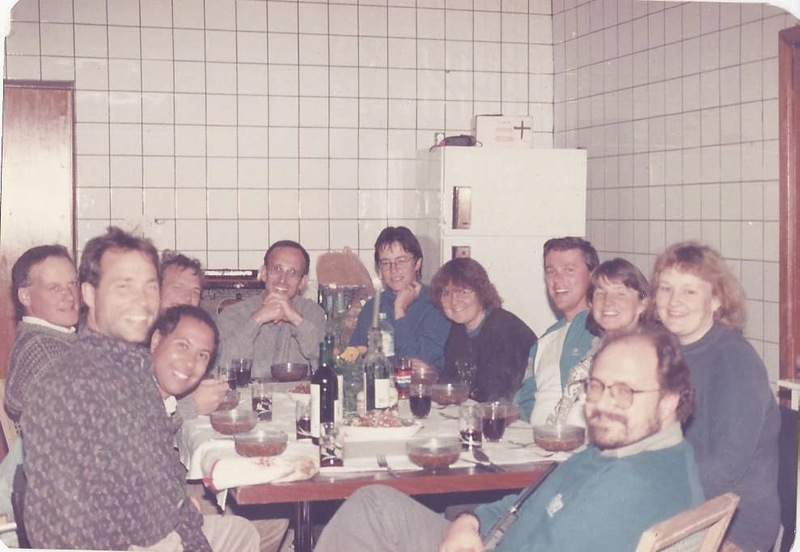 The French had tins of cassoulet, the Dutch had strong coffee and the Italians had wine plus a little tot of spirits in every ready-to-eat meal! We ate surprisingly well and even tried to honour special requests such as doughnuts and lemon meringue pie, one of John Adlam's favourites. 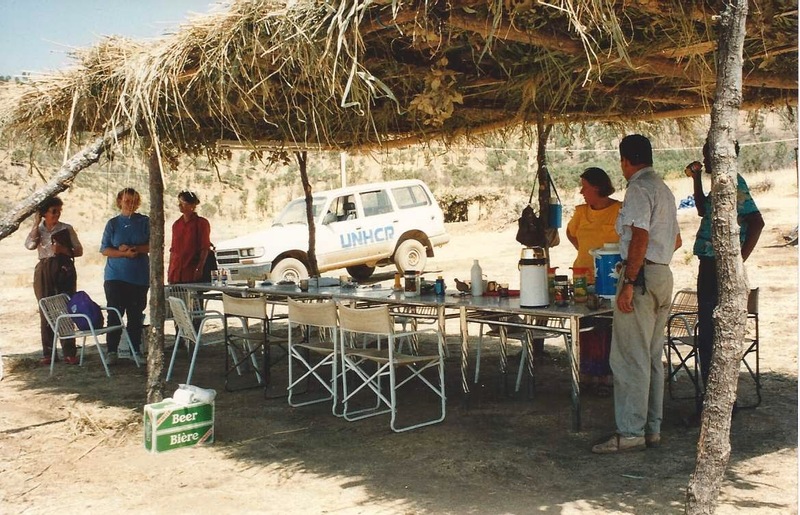 John was a UNHCR water engineer who had previously worked with our charity in Sudan. He rented a room in our house and was great to have around. He also had a landrover and contacts so got us out of many scrapes! Towards the end of my time in Iraq I became country director for the charity at the grand age of 25, representing them at UN meetings and taking care of the team's security and well-being. Honestly, the responsibility was too much for me and I began to feel unwell. 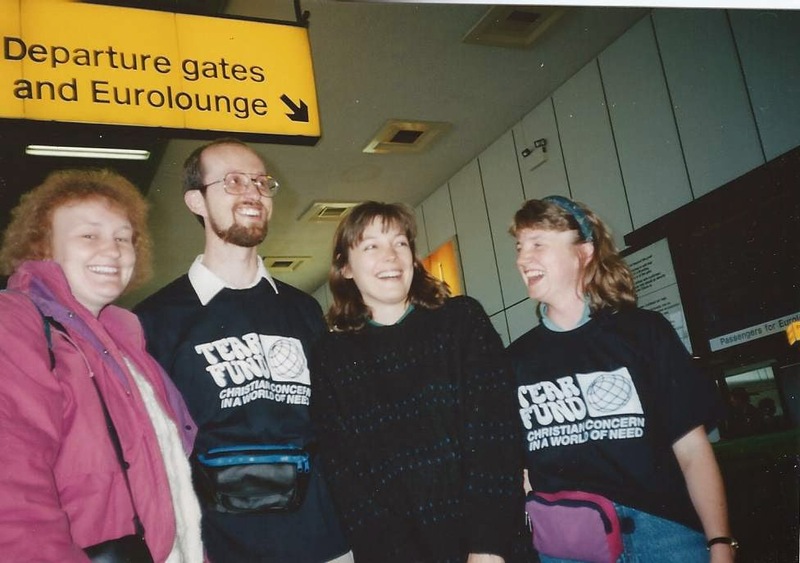 I flew home being investigated for typhoid and Gulf-War Syndrome which was the popular diagnosis at the time. I now know I was traumatised from living in a war zone and suffered from panic attacks for the following year. I couldn't get into a car in the UK without checking under it for a bomb. If I heard a helicopter or a loud bang I ran for the ditch. I couldn't drive in the dark or walk across grass - not leaving the path had been our mantra for a year. I couldn't cope with the choice in supermarkets and I couldn't be alone. We had lived as a team, sharing tents and bedrooms, never travelling alone and always alert for danger. I moved back to London to stay with my parents and asked them if I could share their room, upset when they said no! We compromised by leaving the bedroom door open. In addition to having mild PTSD I missed the team. 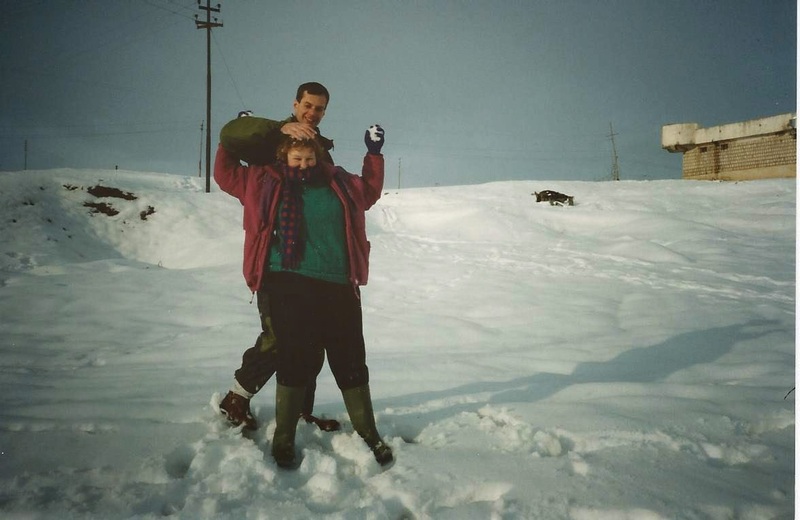 My parents were wonderful but no one in the UK could really appreciate the year I had experienced. Society expected me to come home and get on with life. People asked me if I had had a 'nice time'. How could I respond to that? I decided I need a change of scene and applied for midwifery training in Nottingham, moving up there to do agency work in the meantime and share a flat with a friend of a friend, student midwife Emma Hime. Emma was my saviour. She had spent a year working in Africa and understood some of my re-entry stress. She didn't mind me sleeping in her room on the camp-bed when I was having nightmares. After a while she gently encouraged me to stop starting every sentence with 'when I was in Iraq'. I went along with her to St. Andrew's church and found a community of people to help me through. The church was in the middle of the Nottinghams' red light district and the people were very real from all walks of life. No one was shocked by anything. Emma was great fun to live with and when I decided to buy a house in Nottingham she moved in as one of my lodgers. PTSD was not well understood then, even as recently at the 1990s. The charity realised I was struggling when I turned up on the CEO's doorstep at 1am in the middle of a panic attack. They sent me on a re-entry course which was lovely but full of septogenarian missionaries returning from 40 years in the tropics and needing pension advice! 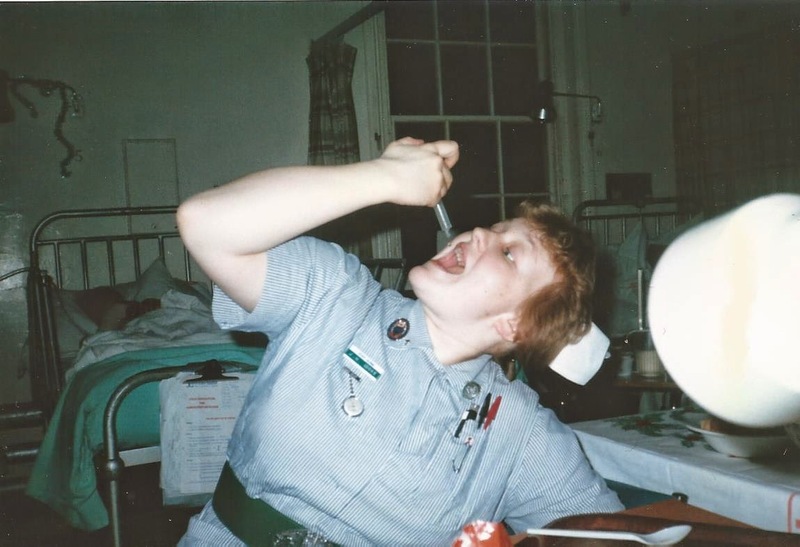 Thankfully I gradually recovered and started midwifery training in Nottingham in July 1992 after working for the summer as the occupational health nurse for Pork Farms Pork Pie Factory! I have recently been re-watching the classic 1980s Prisoner of War drama 'Tenko'. In the last series, the liberated prisoners try to re-build their lives but find it can never return to what it was before. The camp is a reference point for everything and the friendships made there are deeper than any other relationships. It strikes me my experiences in Iraq, though they could never be compared to a Japanese Prison Camp, were nonetheless a defining point in my life where I realised both how strong I was but also how vulnerable. As I have been writing these memoirs I have been shaking and have found it exhausting but also therapeutic. I hope you enjoy reading them. If you were part of the team in Iraq, please also share your memories and photos and let me know if I have distorted the truth over time! Episode 6: Staff Nurse Cooke! I qualified slightly later than the rest of my set thanks to 5 weeks off with chicken pox during my training. However, I was proud to pass my finals at the first attempt and to win the Peel Prize for academic achievement (John Peel was the Queen's Gynaecologist and there is a memorial plaque dedicated to him in the Kings College Hospital chapel). 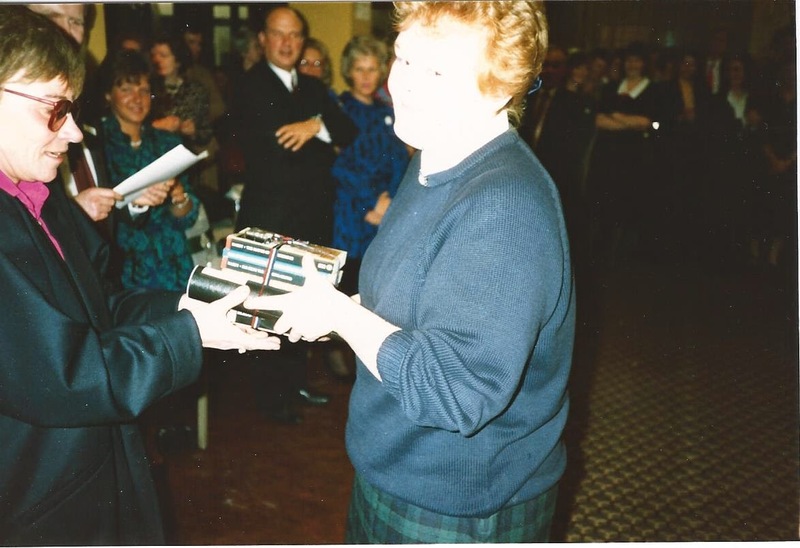 We had a presentation ceremony at Normanby College (Kings' nursing school) where I received my hospital badge and silver buckle and I started working as a Staff Nurse on Ruskin Ward (Male Surgery) at Dulwich Hospital in September 1987. I felt I had found my true vocation. I just loved being a nurse and was so fortunate to work with Sister Ferguson ('Fergie') who had a quiet, empowering leadership style. Some criticised her back-seat approach; she let her staff nurses run the ward whilst she took her own patients and worked alongside students. However, I learned to manage a ward and a mix of staff under her gentle supervision. This was very unusual in the hierarchical 1980s. I clearly remember an elderly man, admitted from a nurses home covered in faeces and pressure sores, confused and aggressive from a urinary tract infection. Fergie volunteered to look after him, as she always did the most difficult patients, and together we washed him from head to toe. I worked many night shifts in runs of 6 or 8 - these days people tend to do only a few nights together but there was a lot to be said for becoming nocturnal for weeks at a time. I slept well during the day and my body clock completely adjusted. I worked most nights with Bond, an older West Indian Enrolled Nurse with a gruff exterior and a heart of gold. She introduced herself with the classic line 'My name is Bond; Enid Bond'! I have no idea what I was doing here but it is definitely not what it seems! The ward was a mix of general and vascular surgery with consultants Mr. Cotton and Mr. Rennie. Many vascular patients were diabetic; most were smokers and in hospital for gangrene, losing first toes then feet and finally one or both legs due to loss of circulation. Vascular pain is dreadful and several patients were on morphine - I became an expert in administering controlled drugs and in managing diabetes whilst on this ward. Some patients were in and out quickly for a hernia repair or gastroscopy but many were long-stay, unable to cope at home and with skeleton community services. Some have stayed in my mind for thirty years. Sam, a bilateral amputee who died of Clostridium Difficile before most people had heard of it, had been a prisoner of war under the Japanese in Thailand. William, a feisty northerner who said 'Bliddy 'ell fire!' more than any other words. Fred, whose wife Gladys was a long-stay patient on a female ward. They used to meet up in the day room and chain-smoke together in their wheelchairs! Fred was aphasic (unable to speak) following a stroke, a bilateral amputee with diabetes and was doubly incontinent. He needed turning and changing many times during the night and I loved caring for him. He was so patient and gracious and it was a pleasure to make him comfortable and kiss him goodnight. He loved kissing the nurses! There were many difficult times but we also had great laughs. 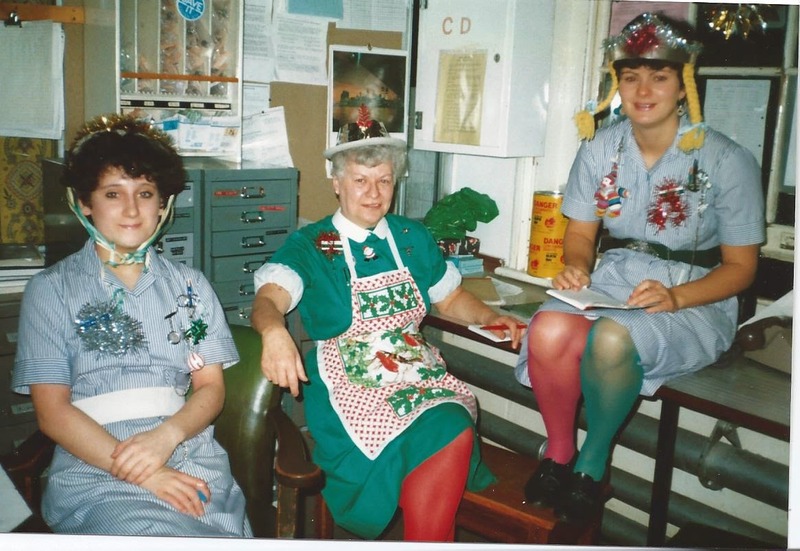 At Christmas we dressed up in tinsel and red and green tights and Mr. Cotton came in to carve the ward turkey at lunchtime. We turned our cloaks inside out, red felt linings showing, and paraded round the wards singing carols with lanterns. The hospital had a May Ball and we came first to the ward in all our finery to see the patients who gave us cheers and wolf-whistles. 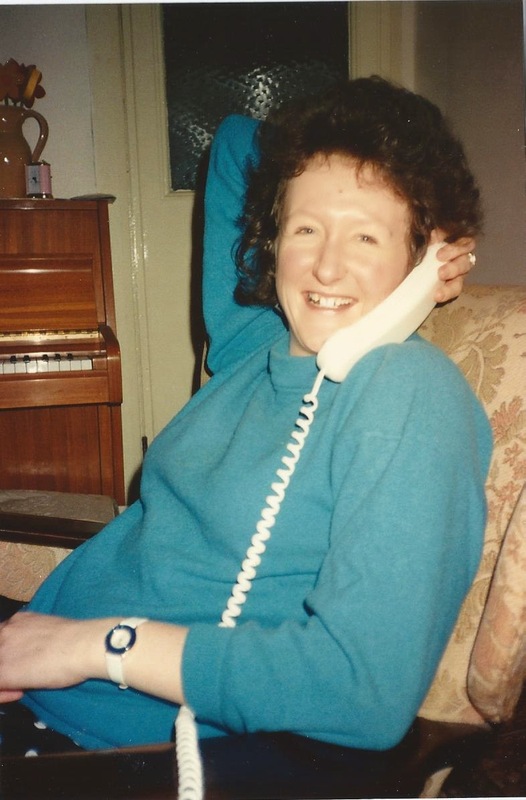 Alison Woollas was a fellow staff nurse and we did many night shifts together, working hard and laughing harder to see us through the early hours. We made illegal toast and poached eggs in the ward's new microwave oven and spent hours devising the 'Nigel Heaton Wind Scale' in quieter moments. Nigel Heaton (now a famous liver transplant surgeon) was a good looking registrar that we all secretly fancied. He was obsessed with flatulence, constantly asking the nurses whether his patients had passed wind and how many times. The wind scale was posted on the office wall and caused great hilarity at Mr. Heaton's expense. He was a great doctor with lovely bedside manner and never minded being called from him bed at 2am for a genuine emergency. One crazy Christmas night with the Kardex! 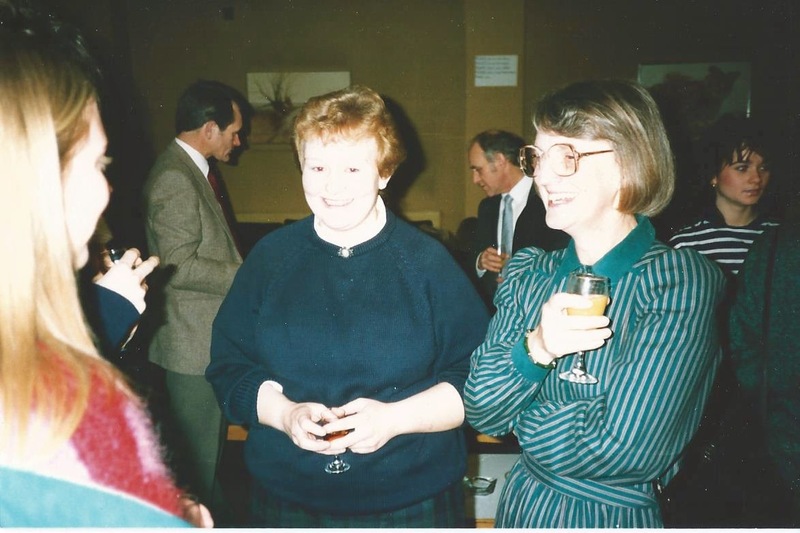 Sister Ferguson (Fergie) and Alison Woollas (right) in their Christmas finery! 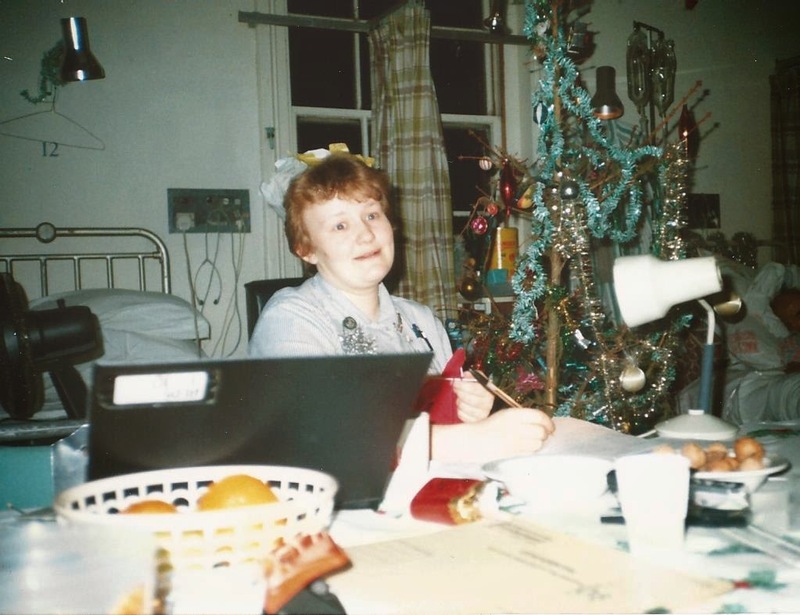 After a year as a staff nurse I wanted to explore my dream of becoming a children's nurse and started looking for opportunities to work on a children's ward to help me make a final decision. One night shift I found a small-ad at the back of the Nursing Times looking for nurses to work with children in refugee camps in Thailand. Nothing ventured nothing gained! A few weeks later, I flew to Bangkok for my first overseas adventure and two of the best years of my life. The rest, as they say, is history!